EHRs used to be document management systems. Now, they are focused on data intelligence. In the new world of value-based care, specialists need help to maintain their independence and stay profitable. They also require the right partners to help them advance patient engagement, achieve better clinical outcomes, and realize operational efficiency. How will they do it? By harnessing the power of clinical and operational data in their EHR and supporting business applications, working together as an HIT ecosystem. For years, businesses in other sectors, such as finance, government, and retail, have analyzed data to measure overall industry performance. Without metrics to highlight what is driving costs and business prosperity, physician groups cannot understand what needs to change to maximize productivity. It is a common challenge that industries face, and one that specialty physicians must tackle to improve their bottom line and secure their future. Unfortunately, physicians typically are not data scientists. However, the next wave of HIT systems can bring that data science element to specialists and their groups. According to the Centers for Medicare & Medicaid Services, 171,000 physicians who did not collect and use data to comply with government regulations will receive a 3% penalty in 2017 for failing to meet meaningful use requirements. Taken together with the rising tide of value-based care requirements playing a critical role in care and outcomes, these medical groups must upgrade data tools to comply. 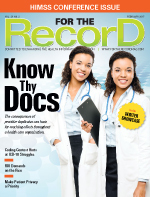 Data-focused HIT solution providers can prepare specialty practices for these coming changes. They help collect and examine data to implement improvements that ensure effective treatment plans at lower costs. In the end, this helps to improve patient health and satisfaction. Today's HIT systems are evolving into business tools that help specialists understand the data and reveal insights for better decision-making. Popular "big-box" HIT systems try to be all things to all providers yet they are tailored to hospitals and primary care physicians, many of whom typically see far fewer patients in a day than specialists. This puts an onerous burden on specialists, who need different clinical and operational data to help maximize patient throughput. Specialists, such as orthopedists, may see more than 60 patients a day—some screening for hip and knee replacements, some for follow-ups after surgery, and others for all the intermediate steps between. Many HIT systems cannot accommodate this appointment volume with template-based systems. In fact, those systems make data entry inefficient and do not enhance clinical workflows, let alone track business-critical metrics. This is the argument for best-of-breed specialty-focused HIT solutions. Some groups acquired by hospitals or health systems are not adopting the integrated systems of their new parent companies. Instead, they stay with their specialty HIT systems—interoperable with their parent companies' technology—because of their ability to serve existing, well-sharpened workflows. For organizations stuck with an ill-fitting HIT system, there are alternatives that can cure the frustration. Specialty HIT systems apply data of all types to help practices learn about and improve their performance. Data can help practices identify clinical protocols that result in the best outcomes for their patients and then standardize them across their organizations. Operational data can lead to insights such as understanding how to deliver the best patient care at the lowest cost, thereby delivering optimal outcomes and increased patient satisfaction levels. EHRs and other HIT solutions have to be customizable and deliver an outstanding user experience—they cannot be barriers to efficiency. Specialists should take an honest and critical look at their current EHR and determine whether it will help them achieve their goals rather than being a workflow roadblock. Physicians should not have to sacrifice productivity to achieve productivity. A productivity-boosting HIT system can unleash the power of data to deliver clinical and business applications through one user interface. It can make compliance with reporting requirements straightforward, not onerous. • Intake staff gathers the patient's contact information, medication lists, medical history, family history, social history, and other pertinent details that form the narrative of that patient's health. • Nurses take and record vital signs as well as the chief complaint that drove the patient to book the doctor visit. • Physicians add to the history of present illness, conduct exams, record the results, and create treatment plans. If everyone is scrolling through the same screens to get to their particular data-entry area, the practice is wasting time, money, energy, and even focus. With role-based data entry, staff can cut down on unnecessary clicking and make time for what really matters: patient care. Next-generation HIT systems can help independent groups maintain their freedom. By blending operational and clinical data, top-performing groups can identify what's holding them back and creating unnecessary costs. Groups can improve physician and staff productivity by having them adopt best practices in the group, which can result in a healthier bottom line for all. This year will bring change to physician reimbursement models. The new administration is deciding its strategy based on the current plan. The recent evolution of government programs makes it clear that provider reimbursement is rapidly transitioning toward rewarding the quality rather than the quantity of care provided. This shift requires the right HIT system to manage such change. These data systems must do more than simply store data; they must be usable and flexible, infused with the data most relevant to analyze practice trends. Demands on medical practices have become even steeper, and the main path followed by big-box HIT vendors geared toward hospital and primary care practices won't help specialists reach their goals. When specialists are empowered to take control of the data capture process instead of being held hostage by it, they will become fans—not frustrated users—of HIT. — Scott Ciccarelli is CEO of SRS Health.